Woodmoore & Gray Jewelers is a subsidiary of Desert Sun Mining and Gems, Inc., and is located at 511 S.W. 10th Avenue, Suite 103, in downtown Portland, Oregon. A full service boutique style jewelry store offering beautiful rings, pendants and earrings featuring fine gemstones, it is the only source for Oregon sunstone jewelry and loose Sunstones in the metropolitan area. On staff is veteran designer, Gary Richmond, a goldsmith/silversmith jeweler whose design and repair capabilities are unparalleled. His jewelry designs from Woodmoore & Gray are renowned throughout the United States and Great Britain. Custom designing a piece of jewelry is a wonderful experience at Woodmore & Gray. For the celebration of a special occasion or one of life's milestones, or to experience the fulfillment of your jewelry dreams, custom designed jewelry is the ultimate creative expression. What makes your experience so enjoyable is that we involve you in every stage of the creation of your special, one-of-a-kind, custom piece, while you view the design process from start to finish in our glass-enclosed studio. Jewelry repair at Woodmore & Gray Jewelers offers you a unique experience. Whether you need a treasured heirloom ring resized, a precious gemstone replaced, or a gold chain repaired, our Jewelry Repair Studio is prepared to assist you. 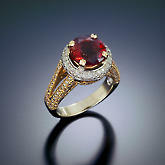 We welcome you to bring in any of your jewelry for a free repair estimate. We also invite you in for a polishing, cleaning and inspection of your jewelry, at no charge. We can repair most watch brands, whether the problem is the crystal or with internal parts. We can even replace the battery while you wait. For more information about Woodmore & Gray, or to schedule an appointment for Custom Design or Repair, call us at 1-503-284-4095, or email us. One of our Customer Service Specialists will respond promptly to answer your questions! The Silver Heron Gallery, located in Depoe Bay, Oregon, is currently featuring ten of the most unique and large Sunstone jewelry pieces designed and assembled by Gary Richmond. For more information on the Silver Heron, call 1-541-765-2886, or go to www.silverherongallery.com.